One Sockapalooza sock down, one to go! 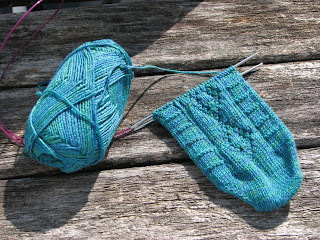 I finished the first sock on Friday night and started the next one Saturday morning. It seems strange to have started the second sock so quickly, since I am usually prone to distraction...which leads to Second Sock Syndrome...which leads to several single socks with no mates. However, that is not an option in Sockapalooza, so I am being diligent. 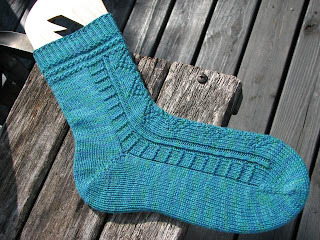 Here we have the completed sock. If anyone shows any interest in the comments or by emailing me, I would be willing to write up the pattern. Oh I just love that. Very pretty, and I'd definitely love the pattern! Wow. Just wow. 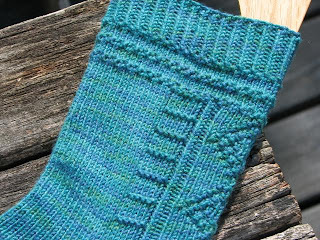 The yarn color and pattern are both absolutely perfect. I admit that I lurk more than I comment, but I had to comment on this sock. Ooooh, it's lovely! Wonderful combination of vertical, horizontal and diagonal! So yes, if you're taking votes and you have time to write it up, please, do! I can't believe some people are done already (or even half way!). Very pretty. I've got to get started on my pal's socks. Nice! Write it up! Please! Then, you should start a Julie's Sockalong and we will all knit one and the world will come together over the needles. Again.